This is the source code that accompanies Applied Cryptography , Second Edition, plus additional material from public sources. The source code here has been collected from a variety of places. Some code will not run on some machines. Use it as you see fit, but be aware of any copyright notices on the individual files. If you prefer, you can order a copy of these files on CD for US$40. Description: A5 stream cipher, used in GSM cellular. Description: Implementations in Java of DES, IDEA, Blowfish, RC4, and SHA. Description: Assorted simple cryptography algorithms. Caesar, Chi-sq, Entropy, Rotor, Vigenere. Description: Big Block Cipher: uses 256K blocks, three random number generators, two substitution tables, cipher-text feedback, and transpositions. Unknown security. Description: Forth implementation of Blowfish algorithm. Description: C++ implementation of the Blowfish algorithm. Description: Java implementation of the Blowfish algorithm. Description: C implementation of the Blowfish algorithm. Description: Pascal implementation of Blowfish in CBC mode. Description: Blowfish implemented in Java. Description: Bignum class, written in Borland C++. Description: Bnlib integer math package. Description: Quick hacked up RC4 brute force attack program. Description: CA algorithm - cellular automata based cryptosystem. Description: CAST-256 AES Submission, in C.
Description: CAST-BAR updated by Joachim Strömbergson to be 64-bit arch safe by changing type declarations to use stdint.h. The code has also been updated to fix errors and warnings as found by the clang compiler. Description: FastCAST is a software library providing Pentium optimized assembly implementations of the block encryption and decryption algorithms used in the CAST-128 cipher. Description: CAST-128 algorithm in C.
Description: Public domain implementation of CAST-128 in C.
Description: Crypt Breaker's Workbench. Program to help cryptanalyze messages encrypted with crypt(1). Description: A cryptographic pseudo-random number generator, designed and written by Bill Chambers. Description: Counts the occurrences of each character in a file and notifies the user when the distribution is too ragged or too even. Description: "Cryptography: Policy and Technology," report. Description: UNIX crypt(1) command: a one-rotor machine designed along the lines of Enigma, but considerably trivialized. Author : Joseph M. Reage, Jr. Description: A few basic cryptographic utilities written by a student for a class. Includes programs for solving transposition ciphers, Chinese remainder theorem, and breaking really small knapsacks. Description: The Cryptlib library contains Blowfish, CAST, DES, triple DES, IDEA, RC2, RC4, RC5, Safer, Safer-SK, and Skipjack conventional encryption, MD2, MD4, MD5, RIPEMD-160, and SHA hash algorithms, HMAC-MD5, HMAC-SHA, HMAC-RIPEMD-160, and MDC-2 MAC algorithms, and Diffie-Hellman, DSA, Elgamal, and RSA public-key encryption. Description: This beta update to the Cryptlib library has a greatly simplified interface from the 2.0 version, and many enhancements and improvements. It contains Blowfish, CAST, DES, triple DES, IDEA, RC2, RC4, RC5, Safer, Safer-SK, and Skipjack conventional encryption, MD2, MD4, MD5, RIPEMD-160, and SHA hash algorithms, HMAC-MD5, HMAC-SHA, HMAC-RIPEMD-160, and MDC-2 MAC algorithms, and Diffie-Hellman, DSA, Elgamal, and RSA public-key encryption. Description: The Crypto++ library is a free C++ class library of cryptographic primitives. MD2, MD5, SHA-1, HAVAL, Tiger, RIPE-MD160, MD5-MAC, HMAC, XOR-MAC, CBC-MAC, DMAC, DES, IDEA, WAKE, 3-WAY, TEA, SAFER, Blowfish, SHARK, GOST, CAST-128, Square, Diamond2, Sapphire, RC2, RC5, RC6, MARS, Rijndael, Twofish, Serpent SEAL, Luby-Rackoff, MDC, various encryption modes (CFB, CBC, OFB, counter), DH, DH2, MQV, DSA, NR, ElGamal, LUC, LUCDIF, LUCELG, Rabin, RW, RSA, BlumGoldwasser, elliptic curve cryptosystems, BBS, DEFLATE compression, Shamir's secret sharing scheme, Rabin's information dispersal scheme. There are also various miscellanous modules such as base 64 coding and 32-bit CRC. Description: Two implementations of CRYPTON, a 128-bit block cipher proposed as an AES standard. Description: The Cryptix library. Crypto extensions for Java. The archive includes source, documentation, and classes. Description: The Cryptix library. Crypto extensions for Perl. Description: The Cryptix library. PGP library for Perl. Description: DEAL block cipher. Candidate for AES. Description: Encryption and hashing routines for BP7 and Delphi. Contains MD5, RC4, RC5, IDEA, Blowfish and DES. Description: Implementation of DES front end; does ECB, CBC, CFB, OFB. Does not include actual DES code. Description: Port of part of Eric Young's DES library to Java. Description: DES implementation, fast but large. Description: DES implementation, fast and portable. Description: DES implementation, fast, with main program and C function library for arbitrary precision integer arithmetic. Description: DES library for MS QuickBasic 4.5 and MS Basic 7.1. Description: DES implementation with several utility programs and many useful extra functions, runs on UNIX. Description: DES algorithm, fast and compact. Supports double and triple DES. Includes portable C version, and optimized 680x0 version. Description: The 2^5 DES S-Boxes. Description: Implementation of DES and DESX. Description: DES implementation, one of the fastest around. Description: Program for generating Diffie-Hellman primes; i.e., p and (p-1)/2 are prime. Description: DFC block cipher, candidate for AES. Description: Michael Johnson's Diamond encryption algorithm. Unknown security. Description: E2 block cipher, candidate for AES. Description: Elliptic curve public key encryption package. Version : pre-alpha quality - use at your own risk! Description: Elliptix is intended to be a complete, 100% pure Java implementation of the IEEE P1363, ANSI X9.62, and ANSI X9.63 standards. Description: Software simulation of the German Enigma machine. Description: A Proposed Federal Information Processing Standard for an Escrowed Encryption Standard (EES). Description: Code examples from APPLIED CRYPTOGRAPHY. Description: Program to count the frequency of every letter in a file. Description: FROG block cipher, candidate for AES. Author : TecApro International S.A. Description: The FROG block cipher in C, by the group which developed the algorithm. Description: The FROG block cipher in Java, by the group which developed the algorithm. Description: Another implementation of the GOST algorithm. Reverse-engineered Sboxes from the program Excellence. Description: The Soviet GOST algorithm (without the correct S-boxes). Description: MD5 and SHA, optimized for speed. Description: HAVAL source code (corrected) plus specification. Description: HPC block cipher, candidate for AES. Author : Ascom Systec Ltd. Description: "Official" IDEA implementation in C, by the group which developed the algorithm. Description: IDEA algorithm in C, optimized for speed. Description: IDEA algorithm in C.
Description: IDEA algorithm in 68000 assembly. Description: IDEA algorithm in 8086 assembly. Description: Tiny code for IDEA implementation in C.
Description: C code for various cryptographically useful statistical analysis functions: Kullback's information measure for a 2-way contingency table, Gamma and repeated functions (Poisson, chi-square, etc. ), Pearson's chi- square, etc. Description: Utility that prints isomorphs. Description: This archive contains KHUFU.C, a hack implementation of the Khufu algorithm. It also contains PRSBOX.H, PRSBOX.C, and MAKEFILE, a program to print S-boxes. Description: Linear congruential random number generator. Description: Simple block transposition cipher based on a linear congruential random number generator. Description: A C/C++/Assembly library for doing fast one-way hashing on the Pentium. Description: The LibDES kit builds a DES encryption library and a DES encryption program. It supports ecb, cbc, ofb, cfb, triple ecb, triple cbc, triple ofb, triple cfb, desx, and MIT's pcbc encryption modes and also has a fast implementation of crypt(3). Description: Truerand is a dubious, unproven hack for generating "true" random numbers in software. Description: logi.crypto is a non-certified 100% pure Java library for using strong encryption in Java 1.1 programs. It includes tools for encryption and authentication. Description: Loki97 block cipher in C, candidate for AES. Description: Loki97 block cipher in Java, candidate for AES. Description: lucre is an implementation (in C++ and Java) of David Wagner's Diffie-Hellman variant on Chaumian blinding. In theory, it can be used for anonymous digital money and other untraceable transactions. There is no connection between this and "-lucre" except for the name. Description: "-lucre": The Unofficial Cypherpunks Release of Ecash. Description: Magenta block cipher, candidate for AES. Description: Mars block cipher, candidate for AES. Description: Mars block cipher, candidate for AES. Source code submitted to NIST for AES. Author : RSA Data Security, Inc. Description: MD4 algorithm, fast DOS implementation. Description: RSA Data Security, Inc. MD5 Message-Digest Algorithm, along with the rfc describing it. Description: Optimization of RSA's MD5 code for 80386. Description: Implementation of Phil Karn's idea for a cipher based upon MD5. Unknown security. Description: Peter Gutmann's Message Digest Cipher. Encryption algorithm which uses MD5 in CFB mode. Unknown security. Description: Internet RFCs (Requests for Comment) for MD2, MD4, and MD5. Description: An implementation of Joan Daemen's MMB algorithm. Description: Michael Johnson's MPJ2. Unknown security. Description: Implementation of classical ciphers -- Caesar cipher, Playfair digraphic cipher, etc. Description: Break of Netscape's shoddy implementation of SSL on some platforms. Description: NewDE algorithm, a DES variant used in the Macintosh program StuffIt (versions 1.51 and 2.0). Description: Nonpatented Simple Encryption Algorithm. Description: The OpenSSL Project is a collaborative effort to develop a robust, commercial-grade, full-featured, and Open Source toolkit implementing the Secure Sockets Layer (SSL v2/v3) and Transport Layer Security (TLS v1) protocols as well as a full-strength general purpose cryptography library. OpenSSL is based on the excellent SSLeay library developed by Eric A. Young and Tim J. Hudson. Description: Includes block ciphers 3DES, DES, RC5, SAFER-k64; public key algorithms RSA, Rabin, ElGamal, Merkle-Hellman knapsack; hash functions Matyas-Meyer-Oseas, MDC-2, MDC-4, SHA-1; signature schemes Rabin, Feige-Fiat-Shamir, GQ, DSA, GMR, ESIGN; pseudorandom generators Blum-Blum-Shub, Micali-Schnorr. Description: Pegwit is a C program for performing public key encryption and authentication. It uses an elliptic curve over GF(2^255), and the symmetric block cipher Square. Description: Same as above, Java version. Description: Same as above, Java version with GUI interface. Description: A list of places to download PGP from. Description: A stream cipher by Ross Anderson. 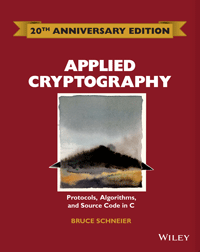 Description: Public-Key Cryptography, a 162-page tutorial. Description: Source code that illustrates polyalphabetic substitution with a running key stream. Description: "Privacy and Anonymity on the Internet": comprehensive summary. Description: Simple Unix time quantization package. Attempt to counter Paul Kocher's Timing Attacks. Description: Radix64 endocing and decoding. Description: A pseudo-random sequence generator by Chris Barker. Description: RFC1750, "Randomness Requirements for Security." Description: Random number mixer: takes in a random source and outputs strong random numbers. Description: Schematic for cheap hardware random bit generator. Description: Random number generator for AT-compatible MS-DOS machines. Description: A tester of random number generators. Description: True random data on a Unix system. Untested on most machines. Description: Randomness analysis, using Maurer's test. Description: Random number generator that uses phase noise in PC crystals to generate random bits. Description: The alleged RC2 cipher, posted anonymously to sci.crypt. Description: Supposedly corrects a problem with a previous posting of RC2 source code implemented in C++. Description: The alleged RC4 cipher, posted anonymously to sci.crypt. Description: Intel 8086 assembly language implementation of RC4. Description: Implementation of the RC5 algorithm. Description: Reference implementation of the RC5 algorithm. Description: The RC5 algorithm -- reference implementation in C.
Description: RC6 block cipher, candidate for AES. Source code submitted to NIST for AES. Description: RC6 block cipher, candidate for AES. Description: Rijndael block cipher in C, written by the developers of the algorithm. Candidate for AES. Description: Rijndael block cipher in Java, written by the developers of the algorithm, for use with the Cryptix toolkit. Description: Rijndael block cipher, candidate for AES. Source code submitted to NIST for AES. Description: RIPE-MD function, written by the RIPE project. Description: Implementations of RIPEMD-128 and RIPEMD-160. Description: RSA public-key encryption in C++. Description: RSAEuro library, international RSAREF replacement. Description: RSA Data Security's Frequently Asked Questions about Cryptography file. Description: Reference implementation of RSA. Includes code for DES and MD5. Bignum package can be easily modified to do El Gamal, Diffie-Hellman, DSA, etc. Description: Michael Johnson's Ruby Hash algorithm. Unknown security. Description: Michael Johnson's cipher based on the Ruby Hash. Unknown security. Description: S-1 CIPHER ALGORITHM software chip simulator. Thought to be Skipjack at one point. Description: Implementations of SAFER K-64, SAFER K-128, SAFER SK-64, and SAFER SK-128. Description: Implementation in C of the SAFER K-64 algorithm. Description: SAFER+ block cipher, candidate for AES. Description: Michael Johnson's SAPPHIRE algorithm. Unknown security. Description: Implementation of Shamier secret sharing. Description: Code to implement a secret sharing threshold scheme. Description: Serpent block cipher, candidate for AES. Description: Serpent block cipher, candidate for AES. Source code submitted to NIST for AES. Description: Old Secure Hash Algorithm (SHA-0). Description: New Secure Hash Algorithm (SHA-1) in C.
Description: Program to turn a one-way hash function into an encryption function. Description: SPEED block cipher algorithm. Description: Compression and encryption in C based on splay trees. Description: What started as an effort to implement the SSL protocol turned into a fairly complete cryptographic library. There is also quite a bit of ASN.1 support, with routines to convert and manipulate the base ASN.1 types, X509v3 certificates, certificate requests, certificate revocation lists (CRL), RSA private keys and DH parameters. There are routines to load and write these objects in base64 encoding and routines to convert ASN.1 object identifiers to/from ASCII representations and an internal form. There are functions for verification of X509 certificates and for specifying where to look for certificates to 'climb' the x509 'tree'. This last part of the library is still evolving. Description: Pseudo-random number generator, based on HAVAL. Description: An x86 assembler implementation of the Tiny Encryption Algorithm. Description: The Tiny Encryption Algorithm, designed and written by David Wheeler and Roger Needham. Description: Hash function designed by Ross Anderson and Eli Biham. Designed to be fast on 64-bit processors. Should run on 32-bit processors. Description: Same as above; designed for 32-bit processors. Description: The Frequently Asked Questions file about the TIS implementation of MOSS (formerly PEM). Description: Carl Ellison's TRAN function, a large-block mixing function. Description: TRAN with the addition of a key. Description: Cipher that does a transposition of an up to 8192-byte block, based on a random number generator. Description: Twofish block cipher, candidate for AES. Source code submitted to NIST for AES. Description: Pentium/Pro/II assembly implementation of Twofish; candidate for AES. Description: Reference C code for the Twofish algorithm; candidate for AES. Description: Optimized C code for the Twofish algorithm; candidate for AES. Description: Java implementation of the Twofish algorithm. Description: Twofish 6805 assembly (smart card) implementation; candidate for AES. Description: Twofish Z80 assembly implementation; candidate for AES. Description: Twofish block cipher, candidate for AES. Description: A program that encrypts using Vigenere, Beauford, or Variant Beauford ciphers. Description: Program to find possible solutions to a Vigenere cipher. Description: Yarrow is a high-performance, high-security, pseudo-random number generator (PRNG) for Windows, Windows NT, and UNIX. It can provide random numbers for a variety of cryptographic applications: encryption, signatures, integrity, etc. Description: The encryption algorithm used in the P.ZIP 2.04g and 2.0.1 compression program.